Your garden provides you with a chance to spend some quality time living a simpler and more environmentally friendly life. If you haven’t starting getting everything you can out of your outdoor space then here are a few good ways of doing so. Perhaps the finest idea for introducing a greener approach to your garden is to grow your own fruit and vegetables out there. This is really easy to do and brings with it a number of benefits. For a start, you can enjoy eating healthy food that you know has been produced naturally and has no food miles attached to it. If you have kids then this is also a fantastic way to introduce them to the concept of producing their own organic food at home and eating more healthily. You don’t need a huge amount of space or any special skills or experience in order to do this. So, now that you have a constant supply of delicious organic food what will you do with it? One great idea is to start eating out of doors more often. There aren’t as many green benefits to doing this as there were in the last point; it’s just a wonderful thing to do. The first step is to pick a flat piece of ground and make it ready for you to eat there. You will probably want to buy some plastic garden furniture and maybe get some outside lighting installed before you start eating out there. You will find top deals on garden furniture like this on sites such as Gumtree, so it won’t cost a fortune to kit out your outdoor space. Ok, so you have got some juicy fruit and vegetables growing out there and some inviting plastic garden furniture to help you relax. What else is missing from the perfect family garden? One nice idea is to set up some games space as well, particularly if there are kids in the family. You could simply set up a football goal in one corner, hook up a basketball net or do whatever else is likely to keep you all happy. This is a low cost and eco friendly way of taking part in more sport and spending more time out in the fresh air. 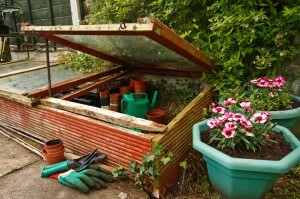 Apart from idea about growing your own vegetables this is probably the top green thing you can do in your garden. If you live in the city then you could turn your garden into a much needed refuge for local wildlife. It is easier to do this than you might think and you will find lots of useful tips on the internet. Setting up a pond is one clever way of getting started and bringing in a lot of wildlife quickly. Among your other priorities are likely to be the access and exit routes for land animals and the supply of food they will find once they arrive. It can be an incredible experience to sit and watch as creatures start to arrive to explore your garden for the first time. Finally, could this be the moment in which you discover the pleasure and benefits to be had from gardening? This is a very environmentally friendly thing to do and a lot of fun as well. You can grab your tools second hand from a site like Local Mart, are get going for practically nothing. One important point to make here is that it really helps to concentrate on native plants and shrubs. This is because they are already in harmony with the setting and often provide safe food for the wildlife. Once you get into the swing of things you could end up spending a lot more time out of doors than you ever thought possible. This is a great article. We just moved and I plan to start growing my own food next year. The only thing I would caution about this article is the use of lighting in the yard. Light pollution is a tremendous environmental problem and it actually negatively impacts plant growth, especially larger species, like trees. Light pollution also offsets the delicate balance of eco-systems which can pose a problem for pollinator species necessary for a good, chemical free garden. I suggest taking advantage of the long summer daylight hours first and then, if supplemental light is needed, use low wattage, energy efficient fixtures that can be turned off as soon as you are done outside. Unfortunately, most solar lighting usually can’t be turned off, so it doesn’t make it a very ‘green’ alternative, given the tradeoffs.